The spacecraft will launch on the upcoming SpaceX CRS-2 mission. The flight will be the second commercial resupply mission to the International Space Station by SpaceX. This image was released Jan. 14, 2013. Update: This story was updated at 10:15 a.m. ET (1515 GMT) on Feb. 28. CAPE CANAVERAL, Fla. — The weather looks promising for the planned Friday launch of a privately built robotic space capsule to the International Space Station, NASA says. 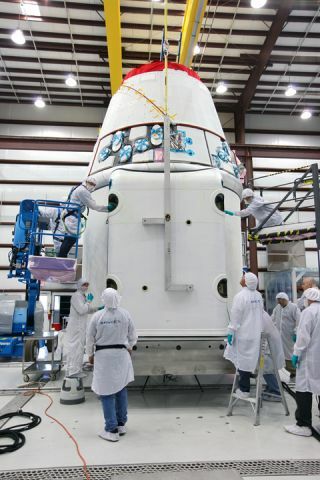 The unmanned Dragon space capsule, built by the private spaceflight company SpaceX of Hawthorne, Calif., is slated to launch toward the space station Friday (March 1) at 10:10 a.m. EST. Weather forecasts predict a 80 percent chance of favorable conditions for launch. NASA and SpaceX officials gave the scheduled mission a final "go" for launch earlier today. On Feb. 25, Falcon 9 and Dragon underwent a successful static fire in preparation for launch to the International Space Station. Engineers ran through all countdown processes as if it were launch day, ending with all nine engines on the rocket firing for nearly two seconds. "The mission is the second of 12 SpaceX flights contracted by NASA to resupply the International Space Station," NASA officials said in a mission update. "It will mark the third trip by a Dragon capsule to the orbiting laboratory, following a demonstration flight in May 2012 and the first resupply mission in October 2012." SpaceX has a $1.6 billion contract with NASA to provide 12 unmanned cargo deliveries to the space station. Another company, Orbital Sciences Corp. based in Virginia, has a $1.9 billion contract for eight mission using its own Antares rocket and Cygnus spacecraft. The Dragon spacecraft is expected to deliver 1,200 pounds (544 kilograms) worth of supplies to the six international crewmembers on board the station. The capsule is scheduled to return to Earth with 2,300 pounds (1,043 kg) of material from the space station when it splashes down in the Pacific Ocean off the coast of Baja California on March 25. SpaceX conducted a successful rocket engine test, known as a "static test fire" on Monday (Feb. 25). The rocket's 9 Merlin engines were fired for a few seconds while the rocket was held down on the launch pad. NASA is relying on SpaceX, Orbital Sciences and other private companies to develop new private spacecraft to supply the International Space Station with cargo and ultimately ferry American astronauts into and from low-Earth orbit. The space agency is also developing a new rocket and spacecraft, the Orion space capsule and its Space Launch System mega-rocket, for future deep-space exploration missions to the moon, asteroids and Mars.